What can you say about our beautiful, friendly girls? Write a paragraph about our rats and post it in a comment. The person who writes the best paragraphs will get their own post in the blog! Complete with a picture holding their favorite rat! Today started off much like yesterday. I slept late, took Scruffy for a walk, made some coffee and turned on my computer. I checked my email, read the news, fed the animals and had my coffee. Around 11, the phone rang. It was my friend, Marylee, asking me if I was busy. 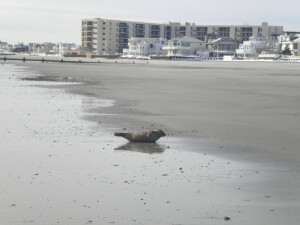 She got a call about a stranded seal on the beach in Longport. I told her I would be glad to check it out. I quickly pulled on my snow boats, coat, and hat, grabbed my camera and ran out the door. When I arrived, a Longport police officer was already there. I told him my name and said I was a volunteer for the Marine Mammal Stranding Center in Brigantine, NJ. He told me what he knew about the seal and I quickly trudged down the snowy beach. As I neared the seal, my heart started to pound. I had never seen a seal up close before! What if it is hurt or ill? What if s/he is bleeding? All these questions raced through my mind. But as I got closer, my fears started to disappear. This was a harbor seal, an adult, and a healthy one. It was resting, lying slightly on its side, its head raised and its rear flippers raised. A perfect ‘banana’. It was a harbor seal, dark brown fur or pelage on its belly, lighter brownish gray fur on its back. And the one thing that let me know that it was a harbor seal–a heart shaped nose! I took some photos of the seal with my camera and phone, then watched the seal for about an hour. During that time I spoke to a few folks who were curious to see what was resting on the beach. 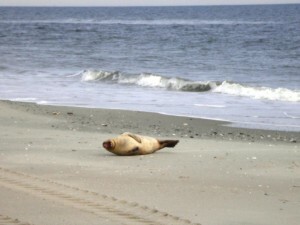 As I was speaking to a woman, I heard a strange ‘slapping’ sound and was glad to see the seal wiggle like a caterpillar back into the surf and quickly swim away. S/he had their rest and was off to the depths of the Atlantic! My phone rang as I sat in my car, thawing out my frozen fingers and toes. It was Jay from the Marine Mammal Stranding Center. “Are you still in Longport, Mary?” he inquired. “Yes, I am.” I replied. 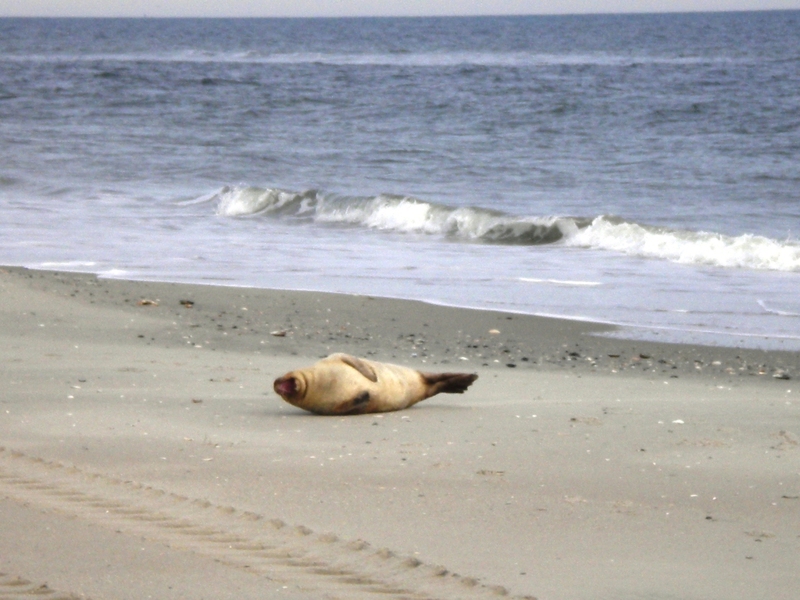 “Well, there has been another seal sighting on 24th Street. Would you mind checking it out?” Jay asked. “Not at all!” came my excited reply. I turned my car around and headed to 24th Street, just 8 blocks away from where the first seal was located. Is it the same seal that I just saw or was this another? If it’s another, is this one injured? As I hurried down the beach, I noticed right away this was another harbor seal and another healthy one! What luck–two seals on one day! I spent another hour or more observing this little guy to make sure s/he was okay. I took pictures and videos and emailed them to the MMSC. 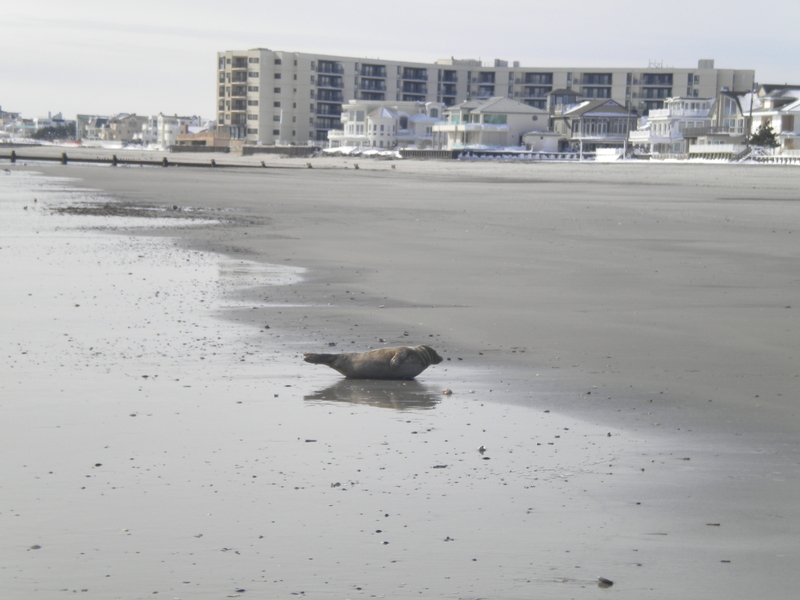 This seal also seemed to have ‘hauled out’ to take a short rest and to warm up. After watching him rest, I became very cold and decided to head home. I knew my little dog was home waiting for my return. I smiled as I left the beach, happy because I had the rare opportunity to witness one of God’s beautiful marine mammals, not once, but TWICE in one day!